A recent ERP study using a spatial cueing paradigm found that the physiological indices accompanying the orienting, shifting and allocation processes of attention, and the performance on the task in terms of speed and accuracy of responding on the other hand covaried (Talsma, Mulckhuyse, Slagter, & Theeuwes, 2007). However, the stimuli used in the former study possibly allowed for bottom-up capture of attention. Therefore the results could not unequivocally be attributed to a top-down attentional process. The present study is a follow-up of the Talsma et al. (2007) study and the stimuli design used in this study controlled for possible bottom-up effects. As a result, participants needed to spatially allocate attention in a top-down way. Indeed, in this study an Event-related Potential (ERP) component associated with the top-down allocation of attention was found; the N2-posterior-contralateral (N2pc). N2pc amplitudes were bigger in the fastest versus the slowest trials for the validly and non-informatively cued targets at posterior scalp sites. The present study replicated the Talsma et al. (2007) findings that the target-evoked N1 components were larger for the faster trials in the validly and non-informatively cued trials. The flow of information that continuously enters our system is enormous. The human brain, however capable of dealing with huge amounts of information, cannot process all this information to the highest level. In order to deal with the overload of input our brain is equipped with an attentional mechanism that can bias the processing of certain information over other information. Stimuli presented at attended locations are processed faster and more accurately in comparison to information at unattended areas. When people anticipate certain stimuli to appear at a specific location, they can direct their attention to that location in a voluntary top-down way; thereby enhancing their perception of that stimulus at that specific location. This preparatory attention to a location in space can modulate perceptual processing by increasing the sensitivity of neurons in the task relevant perceptual areas and desensitizing neurons in the task irrelevant areas (Motter, 1993). As a result of the first mentioned perceptual enhancement, task performance is improved; reaction times are faster, and accuracy is higher. Related to attentional processes are motivational processes, which are also believed to enhance the allocation of attention to a cued location. In a recent functional Magnetic Resonance Imaging study Engelmann, Damaraju, Padmala, & Pessoa, 2009) used incentives to induce variable motivational attention in participants. The results of this study showed that motivation could improve behavioral performance in a Posner spatial cueing task. Evoked responses were enhanced across a distributed network of anatomical sites, associated with attentional processing (e.g. posterior parietal, posterior cingulate and orbitofrontal cortex). Posner (1980) reckoned frontal and parietal areas as the loci of attentional orientation, although, until today the exact relationship between these anatomical sites and attention remains unclear. A study of Grent’-T-Jong and Wolddorff (2007) found that prefrontal areas became activated before temporal areas. In contrast Green and McDonald (2008) found that parietal areas became activated prior to frontal areas. This ambiguity could possibly be explained in terms of experimental design, but nonetheless emphasizes the complex dynamic relationship between cortical areas and attentional processes. A commonly used way to investigate visuo-spatial attention is to use a symbolic cueing paradigm. In this paradigm subjects have to identify a target in either the left or right hemifield to which they have to respond as fast as possible. Beforehand a symbolic cue is presented, which can be one of two types: Informative cues, which can be either valid or invalid. A valid cue gives correct information about the likely location of the yet to be identified target object. The invalid cue gives false information about the upcoming target location. The non-informative cue is non-predictive about the location of the imperative stimulus to be presented. Participants can make use of this information by covertly, that is without moving their eyes, shifting their attention to the expected target location. Several studies have shown that such attentional shifts to the cued location can produce more accurate and faster responses to the imperative stimulus (Posner, 1980; Posner and Cohen, 1984; Posner and Petersen, 1990). It is known, however, that the strength of attentional control fluctuates from trial-to-trial within subjects. The strength of attentional focus is believed to influence the efficiency of processing perceptual stimuli in the brain, yielding shorter reaction times and increased accuracy of the responses. It can thus be argued that attentional fluctuation is also reflected in electrophysiological responses related to the directing and orienting of attention. Talsma et al. (2007) investigated this in a study where ERP measurements were related to performance. In order to perform a post hoc analysis of the variation in attentional control, all recorded trials in their study were divided into ‘fast’, ‘somewhat fast’, ‘somewhat slow’, or ‘slow’ response time groups. It was found that ERP amplitudes elicited by the cue and target stimuli indeed covaried as expected with response times. These results were being interpreted as effectiveness of attentional allocation contributing to the variation in reaction times and to some extend variation in the ERP signal. In addition to the voluntary top-down control of attention, attention can also be drawn by salient (e.g. deviant or promptly presented) stimuli. This kind of attention is also called bottom-up capture. In the former Talsma et al. (2007) study, attention could be attracted to the target location in a bottom-up way, because of two boxes emphasizing the possible target locations, only the box where the target appeared was highlighted when the target was presented. The setup used in the present study resembled the one used in the former study. Participants had to report the relative location of an imperative stimulus in one of two boxes in either hemifield in a Posner spatial cueing task. Importantly, in the current study both target boxes were highlighted when the imperative stimulus appeared, so that not one location would attract attention over the other; bottom-up capture of attention was thus controlled for. The question is now; will the attentional control produced by the cue still produce gain in the identification of the target without these possible bottom-up effects? Faster or more accurate target identification could then be fully attributed to top-down strength of attentional control. Because bottom-up effects were ruled out in the present study, all attentional processes at hand must be related to top-down attentional control. Therefore it was expected that another component would be found: the N2pc. N2pc is an ERP component that is argued to play a role in the top-down attentional selection of task-relevant stimuli locations (Luck & Hillyard, 1994; Eimer, 1996). Many ERP studies have investigated the neural correlates of attention. It is well established that the N1 component is associated with the early selective attentional process. Attended stimuli produce larger N1 amplitudes than unattended stimuli (for a review see Hillyard, Vogel, & Luck, 1998). This amplitude enhancement is oftentimes observed in conjunction with a P1 enhancement, and is known as “sensory gain” effect. However, P1 and N1 components have been shown to yield different sensitivities to valid and invalid cues (Luck & Hillyard, 1994; Talsma et al. 2005). Talsma et al. (2007) indeed found that in validly cued trials, when attention was directed to the hemifield where the target appeared, targets evoked larger N1 components. Because the target-evoked N1 concerns a more early component in the ERP signal, reflecting the strength of top-down attentional control rather than a bottom-up process it was expected in the present study that this component in comparison with the Talsma et al. (2007) study would not be affected differently by the onset of two boxes instead of one. In line with the former study, it was expected that response times would correlate with the early component N1 for the target evoked ERPs. A possible consequence of the new paradigm could be that it made the task more difficult for subjects because possible bottom-up capture of attention was now controlled for and attention could not be drawn to the target location in an automatically guided way. This could possibly reduce accuracy and slow response times in comparison to the Talsma et al. (2007) study. In addition, in line with earlier findings it was anticipated that response times would be fastest for the validly cued trials, intermediate for the non-informatively cued trials, and slowest for the invalidly cued trials. Similarly, it was expected that accuracy is highest for the validly cued trials, intermediate for the non-informatively cued, and lowest for the invalidly cued trials. In total 17 persons (age 18-30, M = 22; 5 males; 14 right-handed) volunteered in this study. One participant was not included in the analyses, because he was not able to complete all sessions. All participants had normal or corrected-to-normal vision. None of them reported a history of mental or sustained physical illness. All participating subjects gave informed consent prior to their participation in the experiment. Half of the participants received credits for an introductory Psychology class, the other half was rewarded 10 euros per hour of participation. Figure 1. An example cue stimulus. Every participant was appointed a specific colour, which was the relevant colour for this person during the experiment as a whole. Each trial started with a fixation period of 1000 ms. Participants were instructed to look at a centrally presented fixation cross, which was surrounded by the outline of a box. Following this fixation period a symbolic cue was presented inside the box at the center of the screen, for a duration of 100 ms. This cue informed participants about the likely spatial location of the subsequently presented target stimulus. 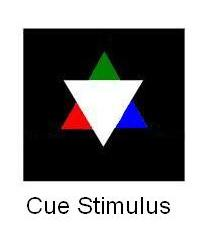 The cue symbol was a six-pointed star (see Figure 1), and was the same as the cue used in the Talsma et al. 2007 study. Each alternate point was coloured differently: red, green, and blue. Two coloured points were oriented to either side of the display and one to the top. Colours assigned were counterbalanced across participants. One third of all cues were non-informative, following that two third of all trials were informatively cued. From the last mentioned attention-directing cues 81.25% were valid and 18.75% were invalid. The possible target locations were indicated by two boxes with white outlines. After a variable period between 800 and 1800 ms after cue presentation the imperative stimulus appeared in the lower left or the lower right position, in one of the possible target locations (left/right hemifield). Both boxes were highlighted, by a transient thickening of their outline. The thickening of the lines was included to create a large enough difference in luminance to create exogenous visual ERP components (P1, N1). The target object consisted of a faint grey dot, which could appear in either the lower left or lower right corner of the two boxes, leading of to four possible target locations in total. In total 12 trial types were used: in factorial combination Cue (3; Left, Right, Non-informative); Hemifield or stimulus location (2; Left or Right hemifield); Target Dot Location (2; Left or Right box corner). Left or right hemifield were both equally likely to be the target’s location. Also, dot location was equally distributed. Participants had to report the corner of the box in which they perceived the target's position. For this end they had to push a button as fast as possible. The left and right response buttons were integrated in the chair’s arms; they had to push the button with their index finger’s corresponding to the target’s relative location inside the box. The target dot brightness was adjusted between blocks using a staircase algorithm, based on performance. After responding a new 1000 ms fixation period began; starting a new trial (for the total sequence of events in one trial see Figure 2). Figure 2. The sequential events in one trial and the start of a new one. Participants sat in an isolated room, which was practically soundproof, the lights were dimly lit, and it was Faraday shielded. The visual stimuli were presented on a 21 inch CRT computer screen using E-Prime programming software on a personal computer running on Windows XP (Biosemi 128-channel system Active Two; Foundation Vision Research Amsterdam, University of Amsterdam & E-Prime; Psychology Software Tools Inc., Pittsburgh, PA, USA). Subjects sat in an adjustable chair at about 120 cm distance in front of the screen. EEGs were recorded with 128 electrodes with sintered Ag/AgCl electrode tips, which were plugged into an elastic cap (Electro-Cap International Inc. Eaton, OH, USA). The recordings were referenced to the left and right mastoids. Horizontal eye movements were detected by two electrodes placed at the outer corners (the canthi) of the eyes. Also for both eyes vertical eye movements, including eye blinks, were monitored by electrodes placed above and below the mid of the orbital sockets. EEG was recorded using a .05 Hz high-pass filter (roll-off 24 dB per octave), and a 20 Hz low-pass (roll-off 6 dB per octave), using a Neuroscan SynAmps (Compumedics USA Ltd., El Paso, TX, USA) acquisition system. Raw signals were digitized with a sampling rate of 500 Hz, and a gain setting of 1000. Signals were stored digitally for later off-line analysis. Before the beginning of the experiment participants received oral information about the experimental procedures, and gave informed consent. Thereafter the participants were connected to the EEG system. Subjects could then briefly review their own EEG signals, and were made aware of the artifacts produced by eye- and body movements. After this, participants could start the experiment. A block consisted of 96 trials, and between blocks subjects were allowed to pause. After finishing ten blocks, they could take a longer break. The total experiment consisted of four parts of ten blocks each. In total every participant performed 3840 trials, which all together took about four and a half hour to complete (pauses not included). Behavioural data. For all subjects and trial types mean response times were computed separately. Repeated measures ANOVAs for the within subject factor Cue Validity (Valid, Non-informative, Invalid) were conducted. Then, trials were divided into quartiles of reaction time (Q1 = 0 - 25% fastest responses; Q2 = 25 - 50%, somewhat fastest responses; Q3 = 50 - 75%, somewhat slow responses; Q4 = 75 - 100%, slowest responses). This subdivision was used in the following ERP analyses. To investigate if reaction times and accuracy differed in this study compared with the Talsma, et al. (2007) study, mean reaction times and performance rates were computed. Electrophysiological analysis. In this study all ERP-values reported were measured on two posteriorly located electrodes (A08 & B05 on the Biosemi 128 electrodes system). Off-line artifact rejection was performed for eye movements. Trials influenced by eye blinks were corrected for, using a time-domain linear regression method. Based on visual inspection latencies of the ERP components were determined for all relevant conditions. Mean amplitudes were then computed using a small time window in which the component peaked. Components of interest are target-evoked N1 and N2pc. All parameters described above will be compared using within-subjects repeated measures ANOVAs and will be tested post hoc with two-way ANOVAs when found significant. As expected response times were fastest in the validly cued trials (M = 522 ms; SE = 10 ms), intermediately fast in the non-informatively cued trials (M = 550 ms; SE = 10 ms) and slowest in the invalidly cued trials (M = 585 ms; SE = 12 ms). These effects were reflected in a highly significant main effect of Cue Validity; F (2,32) = 48.07, p < .0001. Planned post hoc comparisons showed that the Validly versus the Invalidly cued tests differed at a highly significant level: F (1,16) = 51.573, p < .0001. Also, the Validly versus the Non-informatively cued trials differed at a highly significant level: F (1,16) = 41.929, p < .0001. And similarly the Non-informatively versus the Invalidly cued trials differed significantly: F (1,14) = 42.665, p < .0001. Thus, participants responded fastest to the validly cued trials, intermediate to the non-informatively cued trials and slowest to the invalidly cued trials. The accuracy in this experiment was highest for the Validly cued targets (M = 95.13%; SE = 0.44%), intermediate for the Non-informatively cued targets (M = 93.12%; SE = 0.63%), and lowest for the Invalidly cued targets (M = 90.35%; SE = 1.13%). Also, these effects were supported by a highly significant main effect of Cue Validity: F (2,32) = 16.639, p < .0001. Planned post hoc comparisons showed that the Validly Cued trials were significantly more accurate than the Invalid trials: F (1,16) = 17.810, p = .001. Even so the responses to the Validly cued targets were significantly more accurate than the Non-informatively cued targets: F (1,16) = 11.245, p = .004. Also, the Non-informatively cued targets were significantly more accurate than the Invalidly cued targets: F (1,16) = 17.666, p = .001. The more exact relationship between target-evoked ERPs and response times was investigated. First all trial types were subdivided in reaction time quartiles (Q1 = Fastest trials, Q2 = Somewhat Fast trials, Q3 = Somewhat Slow trials, Q4 = Slowest trials). Then these quartiles were used to further compare ERP processes in different time windows and on different factors. Comparisons were made for mean amplitudes of consecutive 10 ms time windows using within-subjects repeated measures analyses of variance (ANOVAs), with a Greenhouse-Geisser correction. The factors used were Cue Type (informative/non-informative), and Laterality (ipsilateral/contralateral) on two posterior electrodes. An alpha ≤ .05 threshold was used for all analyses. Because of multiple testing, only those tests where three consecutive p-values were below alpha .05-level can be considered significant. Validly Cued Trials. The validly cued targets showed a large main effect of reaction times for different ERP components, when comparing all reaction time quartiles using within subjects ANOVAs. N1 peak was estimated to lie between 150 - 180 ms, in this time window the effect of reaction time was found significant for all intervals: all Fvalues (3,42) > 2.42, p < 0.05 - 0.005. Further analyses showed that this effect was largest for the fastest versus slowest trials. All Fvalues (1,14) > 6.71, p < 0.01. This further suggests that response times are indeed strongly related to the amplitudes of N1. Next, when comparing the fastest versus the slowest trials it was found that the N2pc component was significantly larger for the fastest versus the slowest trials (Q1 versus Q4), between 210-250 ms after target presentation all Fvalues (1,14) > 1.97 - 6.00, p < .05 - .01. That is more or less in the target-evoked N2pc time window which was estimated to peak between 240 - 290 ms, for the validly cued trials (see Figure 3). ERP component in the validly cued trials in the topographical picture. The fastest responded to trials showed the largest (most negative) N1 components. In the waveforms above in sequence P1, N1, N2pc and P3 can be recognized. Non-Informatively Cued Targets. Next the relation between target-evoked potentials and reaction times for the non-informatively cued targets was investigated. Again, mean amplitudes were determined for time windows of 10 ms. The duration of the different ERP components was determined by visual inspection of the ERP waves. This was done for the ERP components of interest in this study (N1, N2pc), in every condition. The N1 was estimated to peak between 160 and 180 ms after target presentation. Within-subjects ANOVAs were used to investigate the main effect of response time. This main effect was only significant at 170 ms post-stimulus: F (3,14) = 10.58, p < .05. The effect did not reach significance for the other two time intervals; 160 ms, and 180 ms. Following this, a post-hoc comparison between the fastest (Quartile 1; Q1) and the slowest (Quartile 4; Q4) trials was conducted using within-subjects ANOVAs. For the non-informatively cued targets the N1 component was bigger for the fastest (Q1) trials in comparison to the slowest (Q4) trials. The N1 peak was again estimated to be within a 160 to 180 ms time-window. A significant difference was found in this window for all intervals. All Fvalues(1,14)> 6.34, p < .05. This effect was not found significant for the somewhat faster trials, versus the slowest trials. The N2pc time window was again estimated between 240 - 290 ms post-stimulus. But no significant effect of response time was found for these time intervals. Invalid Trials. Again, multiple within-subjects ANOVAs were conducted to investigate the effect of response time for the N1 and N2pc components in the invalid trials. Nonetheless, no significant effects were found for these components. This EEG-study is a follow-up study of Talsma et al. (2007). One of the aims of the present study was to control for possible bottom-up effects, which could have occurred as a result of the stimuli used in the 2007 study. 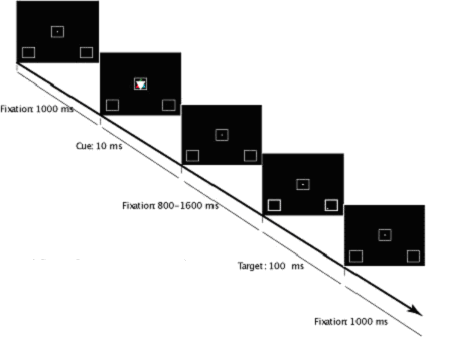 The former EEG-study investigated the relationship between the physiological indices accompanying the orienting, shifting and allocation processes of attention in a Posner spatial cueing task in relation with the performance on the task in terms of speed and accuracy of responding. In both studies all ERPs were grouped by response time. This resulted in four equally large groups of reaction times that were used in further analyses. The former study showed that some ERP components in the validly cued targets were indeed affected by reaction time. The current study replicated these findings, and also effects of response time for the non-informatively cued trials were found. Because the stimuli used in the Talsma et al. (2007) study possibly allowed for bottom-up capture of attention, these effects were controlled for in the present study. Because attention could not be drawn in a bottom-up way, it can be argued that the attentional processes at hand in the current study reflect pure top-down control of attention instead of attentional capture. This possibly made the task more difficult for participants in the present study. Therefore it was hypothesized that in the current study response times would be slower, and accuracy lower in comparison with the former study. Indeed, it was found that reaction times were 50-64 ms slower for all cue validity groups in the current study, compared to the Talsma et al. 2007 study. In addition, responses were more accurate (plus 0.6-2.5%) in the new study. This speed accuracy trade-off can be explained in terms of attentional control; maybe just because the latter task was more difficult participants had to be more concentrated in order to respond correctly; participants could have used a more conservative responding strategy; responding when absolutely sure about their response. Hence, result in increased instead of decreased accuracy in the new study compared with the values found in the former study. Because no stimulus-driven effects could occur as a result of the experimental design, the participants had to rely on the endogenous orienting of attention, which can be enhanced by motivational aspects. Performing well on a task can increase motivated attention (Sabatinelli, Bradley, Lang, Costa, & Versace, 2007). It can be argued that all participants were strongly motivated to orient their attention to the location indicated by the cue, because they were reminded to do so by the experimenters. Feedback about mean accuracy and mean response time was given each time they completed a trial block. In addition, participants were stressed between blocks to respond as fast as possible. That participants did use the cue appropriately, is also reflected in the fact that responses were fastest and most accurate for the validly cued trials, and slowest and least accurate for the invalidly cued trials (Engelmann et al., 2009). The target-evoked ERP waveform starts with a small peak at about 120 ms. This wave was identified as the P1 component. P1 was followed by a negative deflecting wave, which was interpreted as the N1 component. It peaked at about 170 ms after target presentation. It was observed that the fastest trials resulted in the largest N1 amplitudes in the validly and non-informatively cued trials. In addition the trials with the slowest responses resulted in the smallest N1 components. Supporting the notion that N1 reflects an attentional process, as faster trials are to reflect stronger attentional control. The enhanced amplitude can then be explained in terms of the perceptual enhancement produced by an attentional process. This is in line with former findings were N1 was associated with perceptual gain for task relevant stimuli (Talsma et al., 2005). Subsequently a somewhat smaller negative wave was found, that peaked at about 270 ms post-stimulus; this was assumed to be the N2pc wave. In case of the target-evoked ERPs this N2pc can be explained in terms of selecting the target object, in order to produce the correct response in a top-down way. A significant effect of reaction time was found for the N2pc component. Again the fastest responses resulted in the largest amplitudes, in the validly and non-informatively cued trials. Because the stimulus design in this study did not allow for bottom-up effects, these findings underscore the effects of top-down attentional control in target selection and performance on the task. The main aim of the present study was to further investigate the relationship between performance on a spatial cueing task, and the allocating and orienting processes of the human attentional system. Larger N1 amplitudes were found for validly and non-informatively cued targets which elicited faster responses. 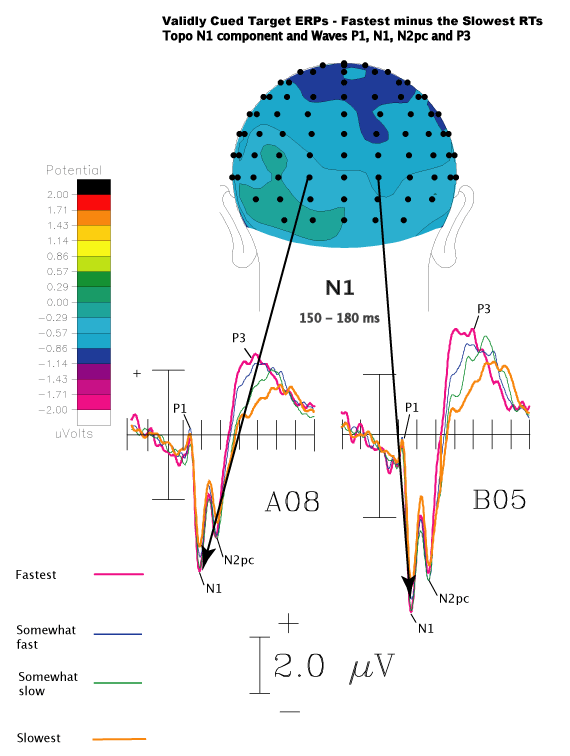 In addition target-evoked N2pc peaks associated with the orienting of attention to relevant locations in space were also found to be correlated with response times. More accurately shifted attention was thus reflected in larger amplitudes for N1, and N2pc. Also targets that evoked faster responses showed larger P3 amplitudes. The findings in this study provide some evidence that several ERP components reflecting different attentional processes are related with performance as measured in response times to a target object on a Posner spatial cueing task. Eimer, M., (1996). The N2pc Component as an Indicator of Attentional Selectivity. Electroencephalography and Clinical Neurophysiology. 99(3), 225-234. Eimer. M., van Velzen, J., & Driver, J., (2002). Cross-Modal Interactions Between Audition, Touch, and Vision in Endogenous Spatial Attention: ERP Evidence on Preparatory States and Sensory Modulations. Journal of Cognitive Neuroscience, 14, 254-271. Engelmann, J.B., Damaraju, E., Padmala, S., & Pessoa, L., (2009). Combined Effects of Attention and Motivation on Visual Task Performance: Transient and Sustained Motivational Effects. Frontiers in Human Neuroscience 3, 1-17. Green, J.J., Conder, J.A., & McDonald, J.J., 2008. Lateralized frontal activity elicited by attention-directing visual and auditory cues. Psychophysiology, 45, 479-587. Grent-‘T-Jong, T. & Woldorff, M.G., 2007. Timing and sequence of brain activity in top-down control of visual-spatial attention. PLoS Biology, 5, 114-126. Hillyard, S.A., Vogel, E.K., & Luck, S.J., 1998. Sensory gain control (amplification) as a mechanism of selective attention: electrophysiological and neuroimaging evidence. Philosophical Transactions of the Royal Society London, B Biological Sciences, 353, 1257-1270. Luck, S.J., & Hillyard, S.A. 1994. Electrophysiological correlates of feature analysis during visual search. Psychophysiology, 31, 291-308. Motter, B.C., 1993. Focal attention produces spatially selective processing in visual cortical areas V1, V2, and V4 in the presence of competing stimuli. Journal of Neurophysiology, 70, 909-919. Posner, M.I., 1980. Orienting of Attention. Q.J. Exp. Psychol. 32, 3-25. Posner, M.I., & Peterson, S.E., 1990. The attention system of the human brain. Annual Review of Neuroscience. 13, 25-42. Sabatinelli, D., Bradley, M.M., Lang, P.J., Costa, V.D., and Versace, F., 2007. Pleasure rather than salience activates human nucleus accumbens and medial prefrontal cortex. Journal of Neurophysiology, 98, 1374-1379. Talsma, D., Mulckhuyse, M., Slagter, H.A., Theeuwes, J., 2007. Faster, more intense! The relation between electrophysiological reflections of attentional orienting, sensory gain control, and speed of responding. Brain Research, 1178, 92-105. Talsma, D., Slagter, H.A., Nieuwenhuis, S., Hage, J., Kok, A., 2005. The orienting of visuospatial attention: An event-related brain potential study. Cognitive Brain Research, 25, 117-129.